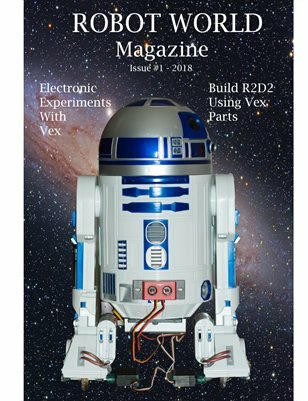 The robotics projects published in Robot World Magazine use components from the Vex Construction Set along with parts from other vendors in order to push the frontiers of robotics and animatronics to new heights. The intended audience for this magazine includes: grade school, high school and college level students, hobbyists, and engineers, who want to expand their minds while having fun building DIY robot projects. The Vex Construction Set is similar to the Gilbert Erector Sets and Meccano Erector Sets with stronger and more rigid metal structural parts than those found in Erector Sets. It also includes a microcontroller and various plug and play sensors and motors. It is currently used in both elementary and high schools, where students of all age levels compete regularly in the Vex Robotics Contest and FIRST competitions held around the country.